It’s great that we have the technology to connect with people across the globe instantly,humans-technology-sign but there’s also a sense of disconnection. If there’s an internet-capable device with a screen anywhere nearby, the immediate world doesn’t get our full attention. It got me thinking about the long term impact of technology on personal interactions, so I requested some input from my Facebook followers. I asked, “Q: What do you think? How does technology affect human relationships?” I was amazed by the overwhelming response. I can’t tell you how many times I’ve wondered what someone meant by their words – whether on social media, in a text or over email. Unless you see the person’s face, hear their voice and understand the environment, you have no idea the context surrounding the written words. Misunderstandings, miscommunications and assumptions result, which have an impact on how we view others. Online Contact Falls Short on Empathy: As a corollary to the context issue, there’s an utter lack of empathy when using technology to interact with others. “I’m so sorry your ___ died” or “I heard you lost your job; I feel for you.” Where is the compassion and solidarity with loss? It certainly does exist within the soul of the person who texted, posted or emailed this – but words don’t convey that. Technology Fails to Deliver Essential Personal Touch: Sometimes you just need dad4b9e19ee5b567e3949063019af651a hug, a handshake or a pat on the back. Once in awhile, I get “stickers” and “emojis” on social media. The thumb’s up symbol or smiley face is cute, but it doesn’t make me feel a personal connection with the poster. Do you use technology to pet your dog or cat? Not likely, because they couldn’t care less. Sometimes we fail to realize that, as humans, we’re also animals that need personal touch. Tech Overload Leads to Cocooning: Technology has become an electronic addiction for some, taking them out of the physical world as they cling to the features it offers. And like many addictions, there’s an impact on the number and quality of human relationships. Conversations through social media and email take the place of traditional interactions and discussions; eventually, a person doesn’t even need to leave the house to communicate with others – and many people won’t. The cocooning phenomenon leads to social isolation that can be crippling for some. “Stan” married his college sweetheart. After two months of marriage, he walked into the home office to find his wife chatting with someone on Facebook. She assured him theguy was just a friend, but Stan soon saw the person’s name all over his wife’s news feed and posts. Not long after, she traveled to meet the man – staying at his place. Their child was born within a year after the visit. Stan sees that whole relationship as something that started and developed entirely online. He’s convinced his ex-wife’s behavior would have manifested at some point, but technology drove the two of them apart faster. Stan’s new relationship started through an online dating site, but he quickly moved it into the real world. He’s understandably not a fan of developing relationships through social media. KEY TAKEAWAY: All in all, the impact of technology on human interaction paints a pretty gloomy picture. But it’s a valuable discussion to have, as it teaches us the value of balancing our offline and online communications with others – personally and professionally. I guess the best approach is to make yourself available through technology only when appropriate, so that it supplements our relationships rather than replacing them. 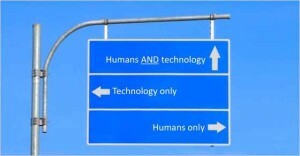 Is this a too-dismal view of technology in human relationships? I’d love to hear your thoughts.